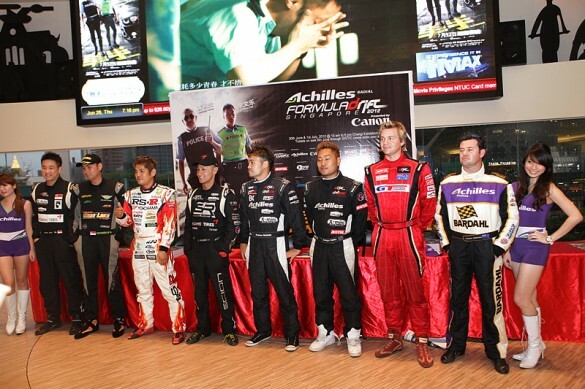 FD Press Conference & Movie Premiere! 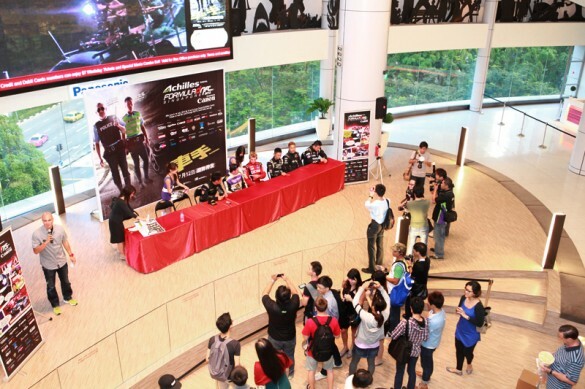 Home » FD Press Conference & Movie Premiere! 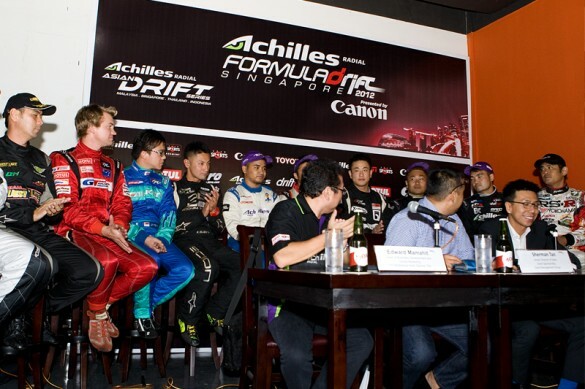 So today was the first day of official proceedings here at Formula Drift Singapore 2012. We started the day with yet another awesome buffet breakfast before heading out to a brand new shopping centre for the official press conference. The shopping centre is located right near the track, and the conference was held in a brand new bar called the MOA Brewing Co. 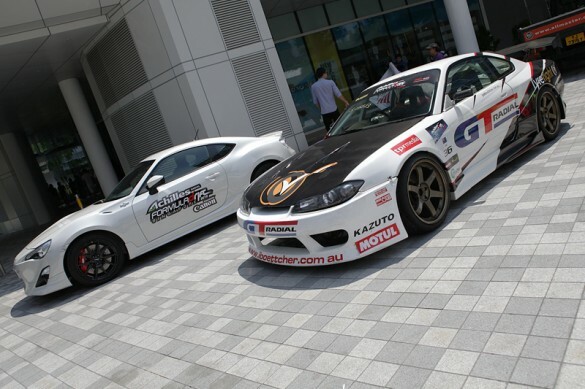 When we arrived we were greeted with 6 of the cars that will be competing in this weekend’s event, including my GT Radial S15! 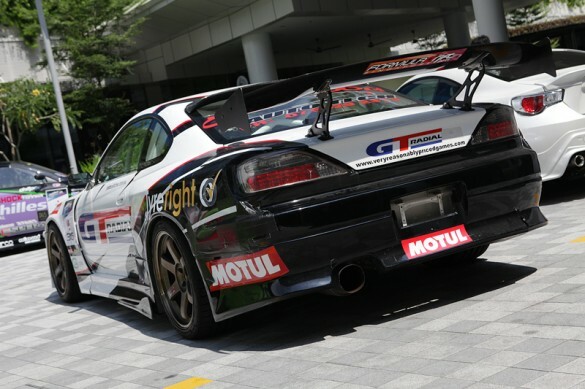 Of course the Lexus IS250c of Mr Saito was on display along with Orido’s RS-R Supra. A new car that was on display there was Ken Gushi’s JZX100 Chaser, looking cool with it’s Casio G-Shock signage. The other drivers and I suited up and took our seats behind the panel for the press conference. Formula Drift co-founder Ryan Sage was the MC, and once the panel had finished their speeches, he asked us drivers some questions! 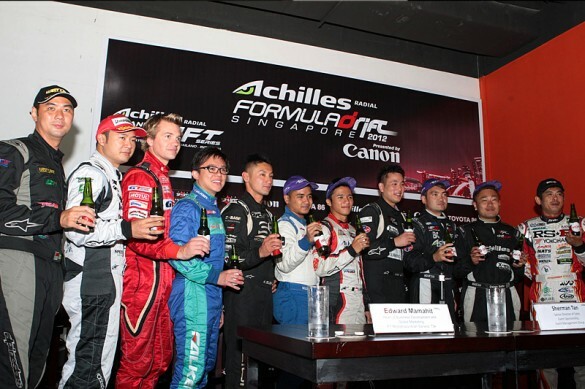 Once the conference was over, there was the usual driver photo in front of the FD Asia backdrop, but with some MOA beer this time! We went outside for some photos with some cars and I was lucky enough to have a few interviews with the local media. 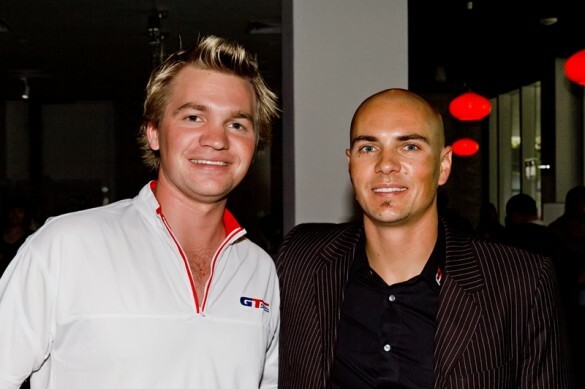 I had a chance to chat with my ‘Nations Cup’ Oceania team mate Daynom Templeman about our plans for the special side event (I’ll give you a little more info on the new Nations Cup format tomorrow!). We then went back to the hotel for a quick stop before heading to the premiere of the brand new movie ‘Motorway’ (released on July 12). 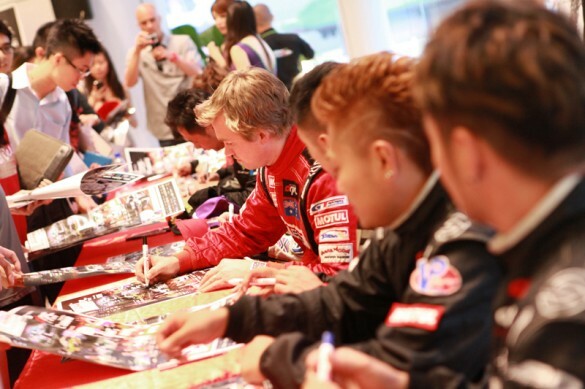 Now this was pretty cool, a few of us drivers got to sign some autographs during a special one-off session for the lucky movie fans! It was certainly something new for us, and the crowd was quite good considering we were away from the track. So tomorrow is the first day at the track and we’ll be quite busy. First is getting the car past the tech inspection, then later we’ll be practicing for the Nation’s Cup and taking a few media personnel and VIPs for rides before the first driver briefing of the event.